Nearly 600 nautical miles off the coast of North Carolina, this island is known for its pastel painted houses, brilliantly colored gardens, cricket matches and charming shorts. Its pink-sand beaches, excellent shopping, and proximity to the U.S. make it an ideal destination for a getaway cruise vacation. Play a round of golf on one of six world-class golf courses. Shop for bargains and sample local cuisine in King's Wharf. Kayak through the Paradise Lakes. This charming port is quintessential Bermuda, with pastel buildings and businessmen bustling around in their jackets, ties and famous shorts. From here, you can set sail to see the more than 350 islands that make up Bermuda. Or grab a game of golf at one of six world-class golf courses in this area. This cultural center built at the remarkable Royal Naval Dockyard offers shopping, restaurants, art galleries, craft markets and eight wonderful museums. For water-lovers it also offers a snorkel park and an extensive watersports facility, making it an excellent destination for the whole family. In the oldest inhabited town of English origin in the New World, you'll find yourself surrounded by history. Visit the Old State House, constructed in 1620, and Gates Fort, built by the original settlers on the shipwrecked Sea Venture, which dates back to 1609. 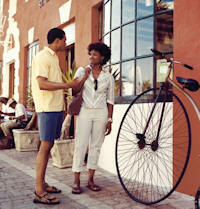 Or set out on a walking tour beginning on Ordinance Island and explore the cobbled streets in town.